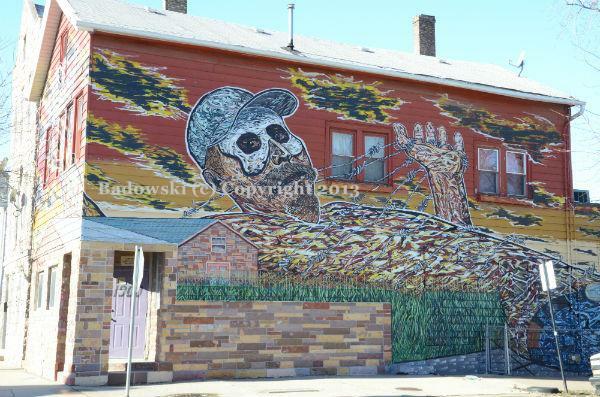 For more than 25 years, Mexican-born artist Hector Duarte (born 1952) has created more than 50 murals in Chicago and the suburbs, including this impressive work that wraps around his home and studio in the Pilsen neighborhood. Based on “Gulliver’s Travels,” this mural symbolizes an immigrant’s journey. In a 2012 interview with Chicagotalks.org, Duarte said the size of the subject represents the success of crossing the border while the barbed wire represents the border itself. “It symbolizes that if we – the community – help him, he can integrate into the community. But if the community doesn’t, he won’t. He’ll fall.” The reclining figure wears a mask and cap, which represent factory and field workers as well as the death of his Mexican identity. Over the years, Duarte has received a number of awards, including a 1995 Chicago Bar Association Award for best work of public art. 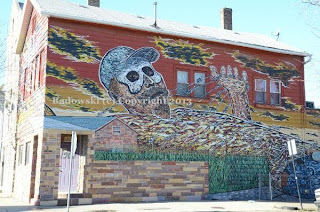 Among his Chicago pieces is a 2004 mural entitled Ice Cream Dream located at the CTA Pink Line Western Station. It was completed under the CTA Arts in Transit Program, funded by the Federal Transit Administration and coordinated locally through the City of Chicago’s Department of Tourism and Culture. More than 50 pieces of art by various artists are exhibited at more than 40 CTA stations. Born in Caurio, Michoacan, Mexico, Duarte studied for five years with associates of muralist David Alfaro Siqueiros. Duarte is the co-founder of the Julio Ruelas Print Workshop in Zacatecas, Mexico, La Casa de la Cultura in Zamora, Mexico and Taller Mestizarte in Chicago.